Surf News Network, 17 November, 2016 – Haleiwa, Oahu – With an emphasis on environment, Vans Triple Crown of Surfing is making event sustainability a top line priority amid six weeks of non-stop surf action, for the fourth consecutive year. Now in its 34th year, the Vans Triple Crown is one of Hawaii’s most sustainably-run events with a full-scope waste management program through Sustainable Coastlines Hawaii. With the help of Sustainable Coastlines Hawaii, the Vans Triple Crown series is on track to divert 60 percent of waste from the landfill in 2016 by implementing tent stations throughout the events. The series will utilize diversion strategies that include: using only compostable serveware with meals; providing water stations and reusable bottles for athletes and staff; fully sorting trash to separate compostables, recyclables and other; use of biodiesel generators and fuel; and public education to encourage attending fans to follow suit. Over the past four years there has been a steady upsurge in recycled, composted and renewable resources pioneered by the Vans Triple Crown. Alongside their 45-day resource management strategy, Sustainable Coastlines will park their 20-foot mobile Education Station at the North Shore Marketplace, adjacent to WSL Hawaii’s new Headquarters. A hub for free community events, daily presentations and public outreach, Pacarro and his team will be on hand to educate about marine debris, plastic pollution and the importance of protecting our ocean. Sustainable Coastlines Hawaii, Vans and WSL recognize that one of the biggest threats to our ocean is plastic pollution. Because of its geographical positioning, Hawaii is a magnet for marine debris and thousands of pounds of trash wash up on its shorelines each year. The message to reduce plastic consumption is at an all-time high and Vans Triple Crown strives to share this with visitors during the six-week surfing series. A significant reduction to the North Shore’s plastic footprint was made in 2015 when Vans Triple Crown provided water refill stations and reusable water bottles for all staff and athletes at the three events. In fact, 36,296 single use plastic water bottles were avoided through the use of refillable water stations, and bottles will be implemented again this year in conjunction with Mizu, an environmentally-friendly water bottle company, to lessen plastic in our environment and spark a new wave of ocean-conscious consumerism. In an effort to further educate the community, the organizations also produced a 5-minute public service announcement, which began circulating on local news stations in September. Weaving in all aspects of North Shore sustainability initiatives, the PSA featured 10-year-old Maika Wilmott and cultural icon Bobby Fernandez as they visited the beaches, food trucks and bike path of the North Shore. The PSA sheds light on the dire state of the environment, but also offers a call to action that hones in on positive lifestyle choices. Packing out trash, carrying reusable water bottles and grocery bags, and being mindful of the Sustainable Coastline trash tents are all good starts. Dovetailing into the Vans Triple Crown’s sustainable food catering initiative, vendor Ke Nui Kitchen will use compostable serving materials for all meals at the three events. Owner and Operator, Thomas Naylor, and his team are dedicated to sourcing local, organic and sustainable ingredients. Ke Nui Kitchen is also part of Ocean Friendly Restaurants, a Surfrider Foundation program that encourages eateries to put the ocean before the bottom line. According to Surfrider.org, Americans use an estimated 500 million plastic straws every day and many restaurants use Styrofoam as foodware. Another leading source of marine debris, Styrofoam is listed as a human carcinogen on the US National Toxicology Report, and is one of the main materials that the Ocean Friendly Restaurants program is trying to eliminate. Oahu has 40+ restaurants that have joined the cause, including Cholo’s, Turtle Bay Resort, Ke Nui Kitchen and Banzai Sushi on the North Shore. The contest itself is powered in part by renewable biodiesel fuel, which is made locally in Hawaii from waste grease collected by restaurants, including many on the North Shore. This B70 biodiesel reduces the environmental impact of the Vans Triple Crown and creates local jobs at Pacific Biodiesel, which is recognized as one of the first commercially viable biodiesel plants in the U.S.
Used to help power the broadcast, biodiesel is yet another way Vans and WSL ensure a sustainably driven event. In 2015, WSL programming had more than 26 million viewing hours, with 1 million+ fans watching the Billabong Pipe Masters live. Furthermore, the Billabong Pipe Masters produces more content than an entire season of Monday night football, so it is little wonder why many surf enthusiasts discover the best seat in the house during the competitions is in their own house. Many residents rely on the Vans Triple Crown as a source of local jobs and economic impact, which amounts to more than $24 million to the state of Hawaii. Pupukea artist Ruben Aira Jr. recognizes this as an opportunity to contribute art and culture to the surfing series. 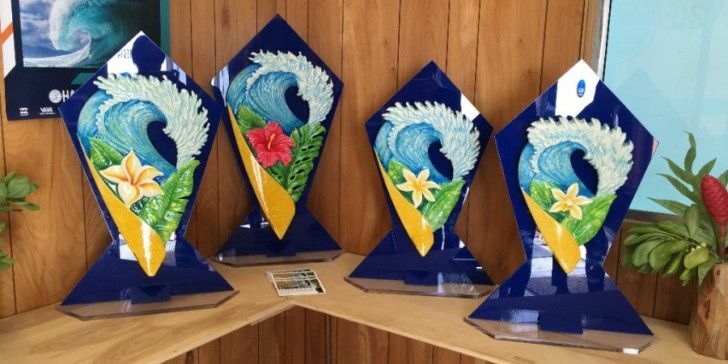 Aira transforms old and broken surfboards into wildly unique sculptures, four of which will soon be treasured as trophies by the 2016 Hawaiian Pro finalists. In an effort to malama their community and perpetuate environmental stewardship beyond the six-week series, WSL Hawaii and Vans Triple Crown will continue to donate broadly amongst local schools, organizations and nonprofits. Support and in-kind beneficiaries include North Shore Community Land Trust, Friends of Ali‘i Beach, Malama Pupukea-Waimea, Haleiwa Arts Festival keiki program, Na Kama Kai, Surfrider Foundation, AccesSurf, Menehune Surfing contest, Haleiwa Elementary, Sunset Elementary, Waialua Elementary and Waialua High’s international sustainable culinary program. Vans also provides proper reusable bags for merchandise sales during the events, but attendees are encouraged to bring their own.